All-Included Herbs Growing Kits – Just Open…Water…Then, Watch it Grow!!! Magic Plant Herbs Growing Kits make it easy to explore the many delights of growing your own herbs. Enjoy many different types of aromatic and culinary herbs. There are many reasons for growing herbs around your home. For some, there are practical uses. In addition, others enjoy the plants for their decorative qualities. All things considered, our Magic Plant Herbs growing kits serve anyone’s purpose at any time. 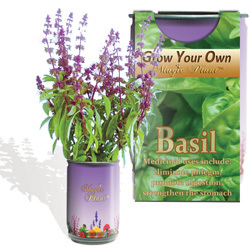 Choose from our large selection of herbs: Basil, Rosemary, Spearmint, Lavender, Sage, Oregano, Parsley, Thyme and more. 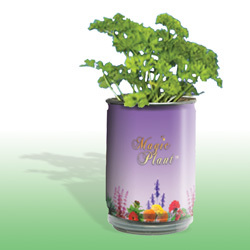 Each Magic Plant Herb container contains pre-planted seeds. Also, the seeds are already planted in a special mineral soil. Simply water the plant. Then follow the directions to grow your fragrant herbs. Lavender is an all-time favorite. It is pleasant to the eye, mind, and soul. Additionally, Lavender has many everyday uses. Since medieval times it’s been used for its calming effect. In addition, it is used for its antiseptic properties. Additionally the aroma helps soothe headaches. Also, this naturally beneficial herb is a great addition to any garden. 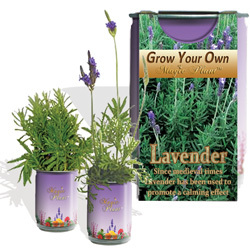 Order your Lavender growing kit. When buds begin to form, move it indoors to enjoy! 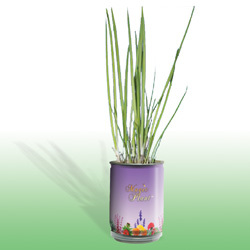 Additionally, you may choose to plant lavender buds in a pot or in the ground. Rosemary has a rich fragrance with just a hint of camphor. It’s a natural antiseptic and has anti-parasitic properties when applied topically. Additionally, smelling the aroma is said to improve memory. 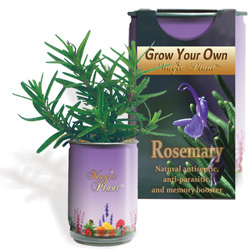 Order your rosemary growing kit today! 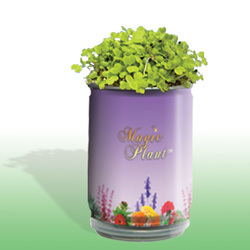 Additionally, you may plant the buds in a planting pot or in the ground. There are many varieities of basil. It produces a fragrance similar to cloves. The classic use of this versatile herb is in tomato based sauces, pesto, and vinegars. Additionally, there are medicinal uses. These include eliminating phlegm, promoting digestion as well as strengthening the stomach. Another use from ancient times, included placing pots of basil on the windowsill to deter flies. In additon, fresh basil leaves can also be placed in a hot bath. Also, steeping the fresh leaves in wine for a few hours creates a tonic. Additionally, you can use it to aid with digestion. Just steep the leaves in water like tea leaves. Then, drink it after it cools. Additionally, placing a drop of basil oil on clothing helps counteract mental fatigue. Order your basil growing kit today! Ideal temperatures for growing: 68-86 F (20-30°C). Growth appears in 5-10 days with full light. Flowers appear in 12-13 weeks. Plant buds in a pot or in the ground. Aslo, when buds begin to form, move it indoors. Spearmint is actually a very well known herb. Originally from North Africa, it is named for the spear shaped leaves of the plant. Additionally, spearmint’s use can be traced back to ancient times. In addition, the Ancient Greeks used spearmint to scent their bathwater. Also, the Romans used it to prevent milk from curdling. Spearmint was also used in medieval times for oral hygiene. It is an antispasmodic, antifungal, carminative, and a stimulant. As a matter of fact, the mint family of herbs is known for being able to promote clarity of mind. 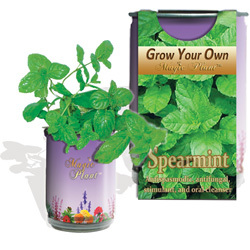 Order your Spearmint growing kit today. Ideal temperatures for growing are between 77-86 F (15-25°C). Sage is historically known for its healing properties. Therefore, it has great value. Consequently, at one time or another it’s been used for just about every condition. Evidence supports its effects as an antibiotic, antifungal, astringent, antispasmodic, estrogenic, hypoglycemic, and a tonic. Additionally, sage demonstrates effectivenss in the management of mild to moderate Alzheimer’s disease. 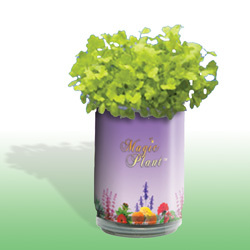 Think of it as more than just a beautiful addition to your herb garden. 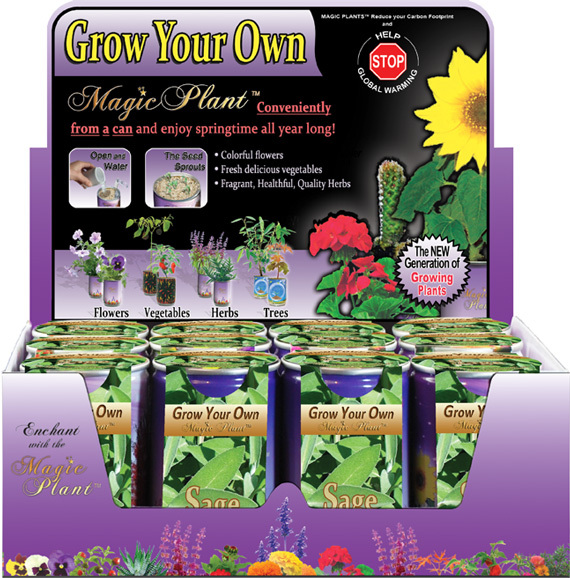 Also choose this herbs growing kit for its many benefits. 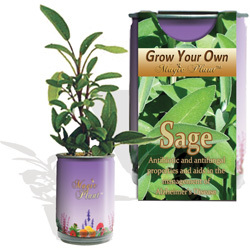 Order your sage growing kit today. Ideal temperatures for growing are 77-86 F (25-30°C). Also, you may plant buds elsewhere in a pot or in the ground. Most have seen parsley beside a dish as a garnishment. However, it contributes to fresh breath despite its bitter taste. This makes it a bit more than just pretty green leaves by your stew or soup. 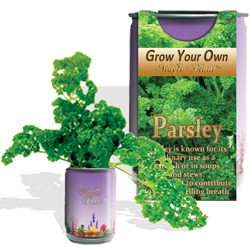 Order your parsley growing kit today. Ideal temperatures for growth are between 72-86 F (22-30°C). Growth appears in about 7-10 days with full sunlight. Also, buds may be planted elsewhere such as in a pot, or directly in the ground. Aromatic, warm, and slighty bitter describe the herb oregano. Traditionally used in Italian dishes , but also widely used in many cuisines. High in antioxidant and antimicrobial properties makes it an excellent health food. The leaves and stems contain antiseptic and sedative qualities. Additionally, the oil extract treats colds, flu, fevers, and more. 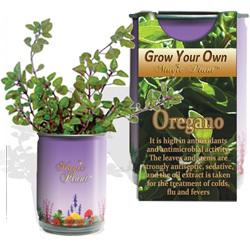 Plant oregano herbs growing kits in your garden for easy access. For this reason, it needs to be on hand just for all its beneficial uses. Order an oregano growing kit today! Ideal temperatures for growing are between 59-86 F (15-30°C). Growth appears in 7-10 days with exposure to full sunlight. Additionally, plant buds elsewhere, either in a planter or in the ground. Ancient Egyptians used thyme for embalming. Additionally, ancient Greeks used it in their baths. They believed it to bring courage. The herb thyme contains the mineral iron. Many cuisines use thmye. Additionally, thyme contains antiseptic properties. This makes it useful and effective for fighting the fungus that commonly infects toenails. Also, make a tea by infusing water with Thyme. In addition, tea helps prevent coughing and bronchitis. 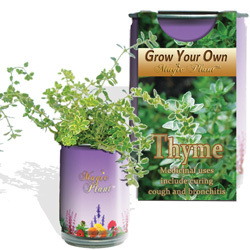 Order a thyme growing kit today. Growth appears in 7-10 days with full sunlight. Growth will appear in 3-7 days with full sunlight. You may plant buds elsewhere in a planter; or in the ground. The tomato has an interesting history. In the 16th century, a British Duke traveled to South America. Then he returned to England with this species for his lover – Elisabeth I. From that time on, Europeans called the tomato plant the “Apple of Love”. Additionally, tomatoes contain lycopene, one of the most powerful natural antioxidants. Ultimately, they improve the skin’s ability to protect against harmful UV rays. 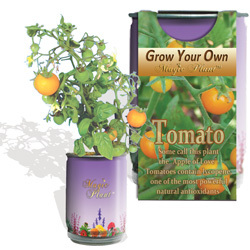 Order a Tomato growing kit today. Ideal temperatures for growing: 70-86 F (20-30 C). Growth appears in 5-7 days. Water once a day or every two days. Transplant after the bud grows 5 – 6 leaves. Keep one healthy baby bud inside the pot. Celery aids in weight-loss. Additionally, celery provides a low-calorie option for fiber. The leaves are used in culinary preparations. Also, celery seeds contain lots of calcium. Order a Celery growing kit today. Ideal temperatures for growing celery: 59-86 F (15-30 C). Growth appears in 3-7 days. Keep 1-3 healthy buds in the pot for cultivation. Also plant the rest elsewhere. It is a soft, hairless plant. The leaves vary in shape. The bottom of the plant bears broadly lobed leaves. However, the upper portion of the plant bears slender and feathery leaves. Actually, the entire plant is edible. However, the fresh leaves and dried seeds are commonly used in cooking. Coriander is described as warm, nutty, spicy, and orange-flavored. In addition, you can think of it as a delightful addition to your garden. Order your Coriander growing kit today. Ideal growing temperatures: 59-86 F (15-30 C). Also, plant the rest elsewhere. The name “shallot” comes from Ashkelon, a city in Israel. Most believe it’s the origin of shallots. Chefs prefer shallots due to their firm texture and sweet, aromatic, yet pungent, flavor. In addition, shallots can be stored for as long as 6 months. 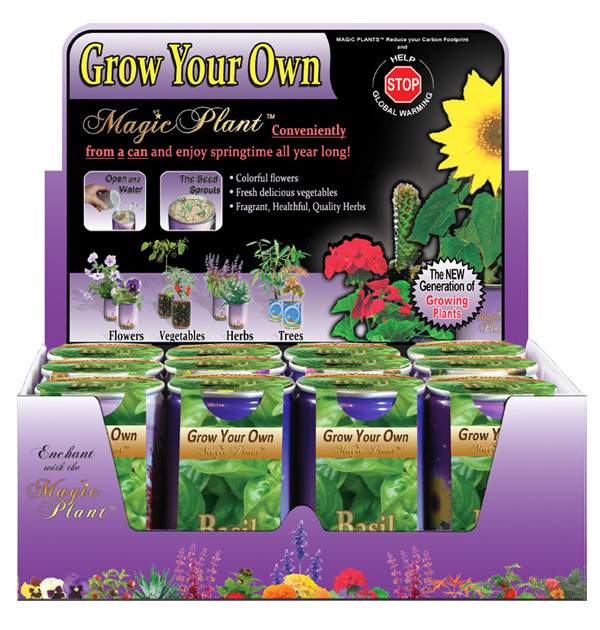 Order shallot herbs growing kits today. Ideal temperatures for growing: 59-95 F (15-35 C). Keep 1-3 healthy baby buds in the pot for cultivation.